IT’S EASY TO forget Ellen Keane is just 21 years old. In Beijing, she became Ireland’s youngest ever Paralympian and four years later the Clontarf native raised the stakes by qualifying for three finals. Big things have always been expected of her. But potential has a shelf life and after a couple of near misses, she needed to deliver at her third Games. “I was so focused on a medal and that really reflected how nervous I was in my Individual Medley,” she explained. “The lead-up to Rio was really getting to me, I was getting so anxious in training because I wasn’t hitting any of the times I wanted and it was really upsetting. Failure to progress to the final of the Individual Medley, her first event having waited a couple of days to compete, wasn’t part of the plan and a rather inauspicious start. She looked off the pace and fraught with tension. 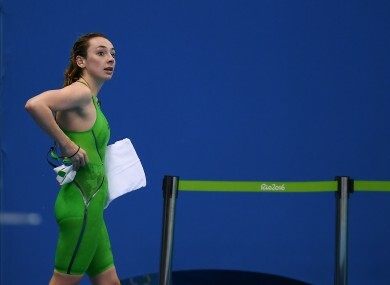 With the weight of expectation on her shoulders, the nerves were affecting Keane’s performances so in the three days before her 100m breaststroke heat, something needed to change. All of a sudden, Keane looked like a different swimmer. She’s always had the stroke, power and strength to match her rivals but allowing herself to swim naturally and release the shackles helped rediscover her form. A comfortable victory in the breaststroke heat hinted that four years of hard work and sacrifice had finally clicked for her. Then, the moment Keane and her family waited so long for. With her family and team-mates in the stands at Rio’s atmospheric Aquatics Stadium, Keane fulfilled her true potential with a stellar performance to claim a brilliant bronze. Her reaction, and the jubilant scenes it sparked, told its own story and was one of the standout moments from these Games. From the 13-year-old prodigy we first saw eight years ago, Keane had come of age. “Winning a medal has given me a lot more confidence and I think if I had have come to these Games and not won a medal I don’t really know what have happened in the next four years,” she admitted. “Once I got on that podium, I feel like I’m a completely different swimmer. Over the next four years I just need to work on relaxing and take it as it comes and enjoy the experience. Keane was able to share the moment with her parents, who grabbed attention themselves with their levels of support not only for their daughter but the whole Irish team. “I know they’re there, before when I raced I just kind of ignored them. But it’s the Paralympics Games, it’s Rio and they’ve got all their outfits and the public are loving them. “Now when I come out I give them a little wave and it’s nice to know where they are so I look at them when I finish. “This is definitely a start, it’s kind of put me on the map now that I can say I’m a Paralympic medallist. People will take it seriously. From there, Keane will take a well-deserved break and refocus ahead of a winter of training. The months of overseas camps and hours in the pool will be made a lot easier with a bronze medal in her possession — but this is only the start. “I had to wait a while for this to come but I’m determined to build on it for Tokyo,” she added. Email “'If I came to these Games and left without a medal I don't know what would have happened'”. Feedback on “'If I came to these Games and left without a medal I don't know what would have happened'”.